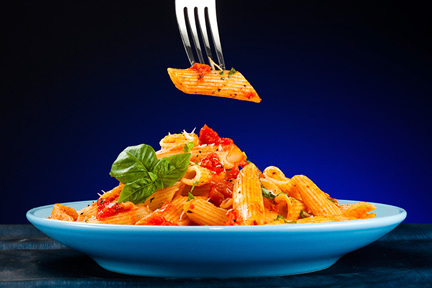 You know you should eat more slowly to lose weight… but if you struggle to pause between bites, use a smaller fork! British researchers say it’ll reduce your calorie intake by as much as 29%. Because by forcing you to take smaller bites, it gives your brain a chance to register fullness. And by taking MORE bites, your brain will also think you’re eating more – so you’ll feel satisfied sooner. And you’ll actually want to eat less than usual. Why is my stomach rumbling? Did you know that a growling tummy isn’t necessarily a hungry tummy? According to Dr. Ryan Shelton, all it means is that fluids and air are moving around in your intestinal tract. If you don’t want a noisy stomach – like if you’re going on a date – eat more slowly, and do more listening than talking, so you take in less air. Do you suffer from heartburn? If you get acid reflux, the best thing you can do is to eat less – and eat slowly. That’s the word from gastroenterologist, Dr. Marie Borum. She says people who get frequent heartburn are better off eating 5 smaller meals a day than 3 big ones. And after a big meal, try not to lie down. But if you do, lie on your left side, which enables your stomach to empty properly. That way, less acid will back up into your esophagus and cause burning. Here’s a good tip to remember as you sit down to your next meal. 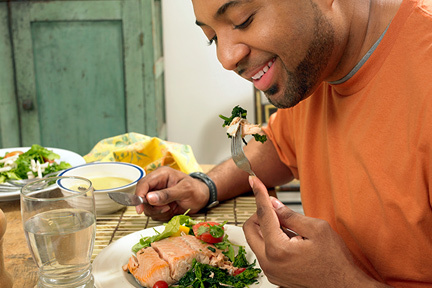 Eating any meal more slowly can actually make your stomach flatter in the hours afterwards. Why? Registered dietitians say that it reduces belly bloat because you don’t swallow as much air as you do when you eat large mouthfuls quickly. Buy blue plates. Research shows that blue is a natural appetite suppressant, so incorporating the color around your dinner table or kitchen will make you eat more slowly and eat less.